Ayurvedic Self Massage - this experience (also known as Self Abhyanga) calms your nerves and soothe your senses. It helps you connect more lovingly to yourself. In Ayurveda oil is a highly regarded potent healing agent. The word "sneha" in hindi means both “love” and “oil" - having liberal amounts of oil applied to the skin is seen as an act of love and caring. 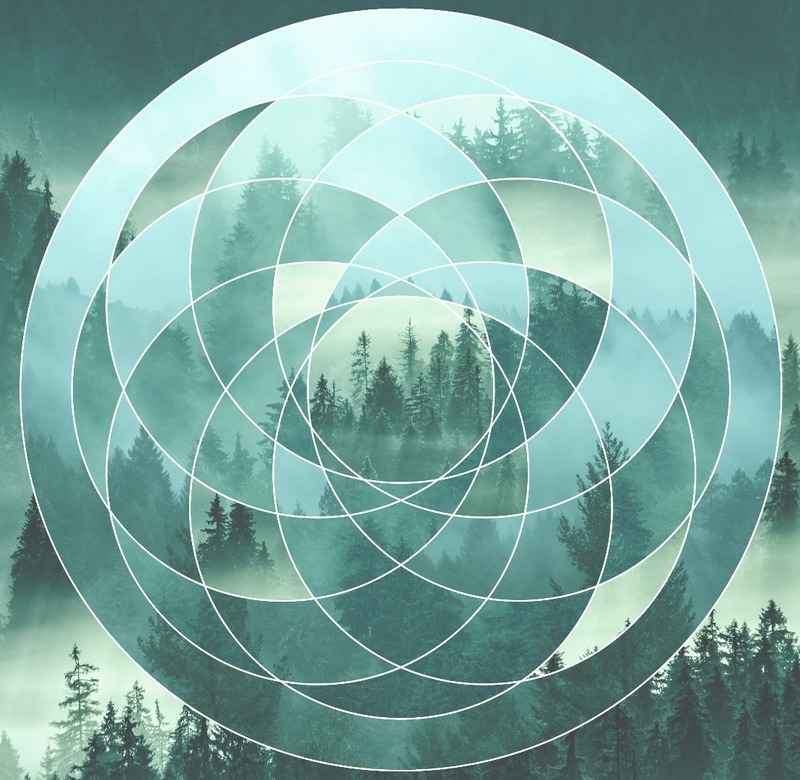 It’s been scientifically proven that applying oil with therapeutic touch increases the happy hormones that are connected to bonding and a sense of well-being. It also decreases stress hormones, relaxes muscle tension, lubricates joints, softens the skin, and aids in detoxification. Either before, during, or after a shower or bath, apply a layer of oil over your whole body. Massage into your face, chest and throat. Massage your abdomen, up on the right, across the top, and down on the left in the direction of digestion. Massage as much of your back as you can reach. Then starting with your shoulders, work down the arms. Massage the oil in lovingly and thoughtfully. Massage circularly around the joints (shoulders, elbows, wrists) and do long strokes up and down the long bones. Breathe while you do this. The tempo should be rhythmic and repetitive. In a similar sequence massage your legs one at a time starting with your hips and bottom in circular motions. Long strokes up and down the thigh. Circular at the knee, long strokes at the shin, circular at the ankle. End with some foot squeezes. Do each limb at least twice, front and back. Our Dragontree Ayurvedic Body Oils were crafted by Ayurvedic Specialist, Briana Borten. These oils are each formulated to help balance one of the three primary doshas. 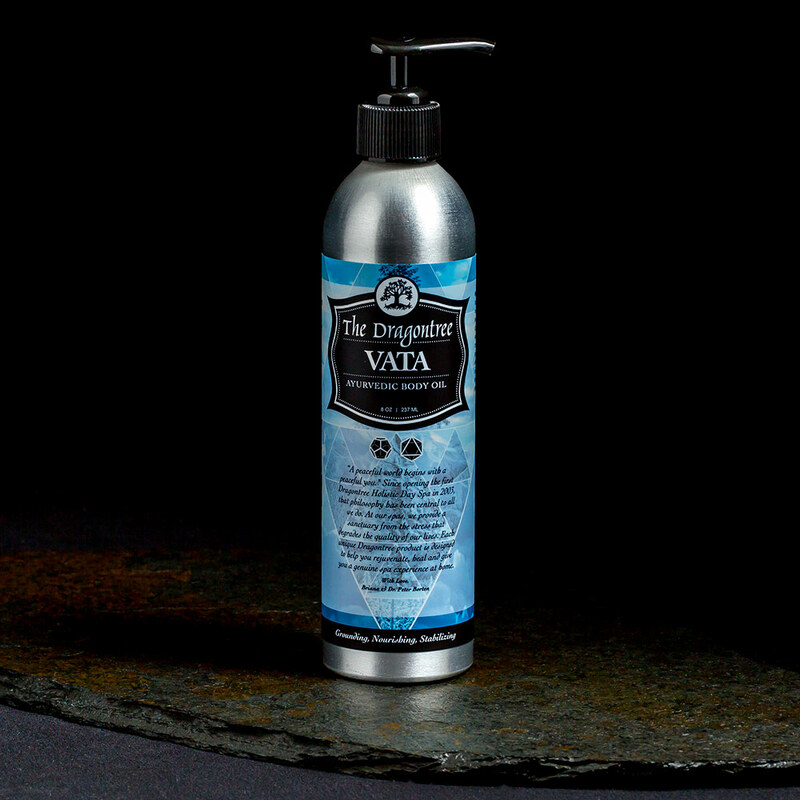 Vata Body Oil: Olive Oil, Ela (Cardamom), Bandhuka (Hawthorn), Bola (Myrrh), Vacha (Calamus), Ashwagandha (Winter Cherry), Yashtimadhu (Licorice), Essential Oils of Basil, Fennel, Lavender, Cinnamon, Elderberry Extract (Natural Preservative). 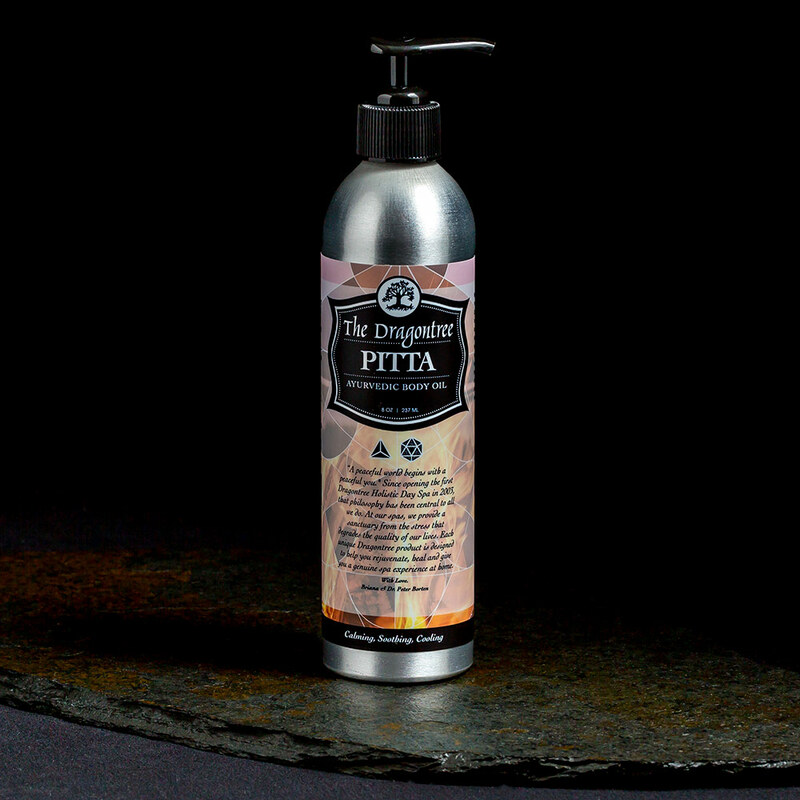 Pitta Body Oil: Olive Oil, Phudina (Mint), Sevanti (Chrysanthemum), Trayamana (Gentian), Rajakshava (Dandelion), Rehmannia, Yashtimadhu (Licorice), Padma (Lotus Seed), Essential Oils of Peppermint, Clary Sage, Geranium, Vetiver, Elderberry Extract (Natural Preservative). Kapha Body Oil: Olive Oil, Almavetasa (Rhubarb), Pippali, Sunthi (Ginger), Marich (Black Pepper), Twak (Cinnamon), Vacha (Calamus), Tulsi (Holy Basil), Essential Oils of Sweet Orange, Ginger, Sage, Vetiver, Black Pepper, Elderberry Extract (Natural Preservative). Tri-Doshic Body Oil: Olive Oil, Mahashyama (Fennel), Gokshura (Tribulus), Angelica Sinensis, Haritaki (Chebulic Myrobalan), Essential Oils of Lavender, Frankincense, Fennel, Elderberry Extract (Natural Preservative). Made by hand in small batches in Portland, Oregon to keep the quality of ingredients effective, there are no artificial fragrances or unnatural preservatives in our products. We take your experience and the quality of our products seriously. If you are not completely satisfied with this artisan product, we will happily refund your money. Please see www.thedragontree.com/guarantee for details.